In 2011 the BBC made a quaint and fascinating television programme entitled "A303: Highway to the Sun". It was repeated on BBC4 just a few nights ago and it can be viewed here: https://vimeo.com/25813595. Tom Fort introduces it by saying, "The road is an entity in its own right. It could lead me into the past. It could also bring me back to the present." And so it does - well at least 2011 - already drifting away into that nether world of legend and mystery. 1. Highway to the Sun? Tom Fort, in his iconic Morris Minor Traveller, tootles happily along the course of this ninety-two mile British 'A' Road, stopping periodically on the way to point out land marks, and muse in consequence, on a long and fascinating British history. As such this also becomes an odyssey, not only of distance, but of time. Apparently it is one of the most successful programme of its sort to have emerged from the BBC4 stable, having been repeated no less than eighteen times on national television to date. Created on a shoestring budget and with a minuscule production team, it would put the major film franchises to shame. It is the antidote to all that is modern, and aggressive, even as the traffic, never far distant, rushes past. The 'traffic' of history, to which he refers, is however, full of drama and violence. He is able to do, what few on the meandering highway are able or motivated to do: stop, discover and reflect on interesting times. As such not only does he reveal the fascinating vistas hidden from us but also reminds us that in continually rushing from A to Z we miss most of the alphabet in between. 2. A Metaphor for Life? If every journey, is a metaphor for life, the A303 is a particularly appropriate one. As 'A' Roads go it is a fairly humble one. British roads are classified as 'A', 'B' or 'unclassified' (to which from the '60's we must add 'M' for motorway) according to their considered importance in a system that was progressively introduced from only 1919 onwards, although the routes themselves of course originate in pre-history. The A303 is undoubtedly such a road. The A303 both begins and ends unobtrusively, not at glamorous towns or cities, but merely as junctions to other roads. Unless specifically pointed out it is hard to realise when it begins (as a bifurcation of the M3) or finishes (where it merges into the A30 in deepest Devon) a life metaphor for the mass of humanity, starting and ending in obscurity. It was the motor car and increasing road transport that made classification an urgent necessity in the early part of the 20th Century. A1, 2, 3 and 4 all radiate from London to other centres of population. All the other numbers follow in a sort of hierarchical system. From this we can deduce that the A303 was almost an after-thought in the national road system and priority, which has been rather borne out in the allocation of funds for its improvement over the years. Although designated as early as 1800 as "the New Direct Road" between London and Exeter by William Hanning, because it tended to skirt and avoid the usual settlements and towns either side of it as can be seen on the above map. It was not until 1958 that it was designated a "Trunk Road" by the Government, effectively prioritising it over the old A30, which for much of the way runs parallel to it. Improvements to both road and transport progressively reduced journey times from Exeter to London. In 1674 it reportedly took eight days. By the late 18th Century, with the introduction of Turnpike Trusts, this was typically down to four days. However in an 1831 competition between the old and 'new' routes, a dead heat time of thirteen hours was achieved! Perhaps one of the reasons for the popularity and success of A303: Highway to the Sun is because so many of us have travelled the road and relate to it. No journey is uneventful. In fact it is packed with innumerable events that tend to fuse into an indistinguishable blur. Each second at speed is a kaleidoscope of moving objects and stationary ones. Occasionally incidents are more memorable, as in the case of accidents, breakdowns and other interruptions to the onward course of the journey. Fellow travellers can make a boring trip fly or drag. The modern road becomes an ever-changing, never-ending scene of incident and movement that is quite mind-boggling. Yet our own experience of it is viewed as a chronological and sequential continuum, punctuated with personalised events, memorable to greater or lesser extent. As an individual who has travelled the road on numerous occasions over the years, that would certainly be my take on it. The film title is prompted of course by the fact that prior to Motorway and Foreign Holiday, this was the principal route from Metropolis to the West-Country counties of Devon and Cornwall, ever associated with balmy summer holidays, kissed by the sun and swept by the sea. Even to think of it is to reignite the nostalgic excitement of setting off on a personal odyssey of delight. In the mid-fifties when ownership of a car was still comparatively rare, we would set off for Bantham or Looe or Coverack for two weeks in a caravan perched on the cliffs. I remember just gazing out at distant white sails on the ultramarine bay. Then in my first adult occupation at Honiton, every week I recklessly tried to break my own record to and from either Bristol or Plymouth in a two litre Triumph Vitesse or Lancia Fulvia, once being pulled over by a police car just as we entered into Devon, a section of the road shown twice in the film. Was it to remind me of my youthful arrogance and stupidity? But how I loved to drive those cars and still dream I am in them. Multiple journeys were subsequently made over all or part of the A303 until it became a familiar friend, with each bend and settlement, every bump and hazard, every junction and landmark, anticipated on an internal mental map. The huge thunderstorm with which the windscreen wipers could hardly cope on my last tear-soaked journey of separation from London. The night I slept in a snow-bound car near Andover and woke to find a packet of cigarettes left on the boot by a complete stranger. The night I slept in the shadow of those huge Stonehenge monoliths and felt the power of a lost race. The vehicles that went out of control in front of me, and missing death by a hair's breath as a juggernaut rushed past. Of the jams and the roadworks and diversions. Of the irresistible sleep and hallucinations. All those revolutions, of fuel consumed, of pollution and noise created and all the road kill come upon or passed. In total, an inventory of thousands on thousands of miles and interminable lost time the A30, the A37 and the A303! All of this of course is largely lost to personal memory, let alone a common social one and is repeated a myriad times over for all the millions that have passed that way. Just occasionally an incident is captured by a news report or photograph or as in the case of BBC4 by a television programme that in some way appeals and resonates with the many. The following image captures such a moment, recorded in its time for its extraordinary nature. 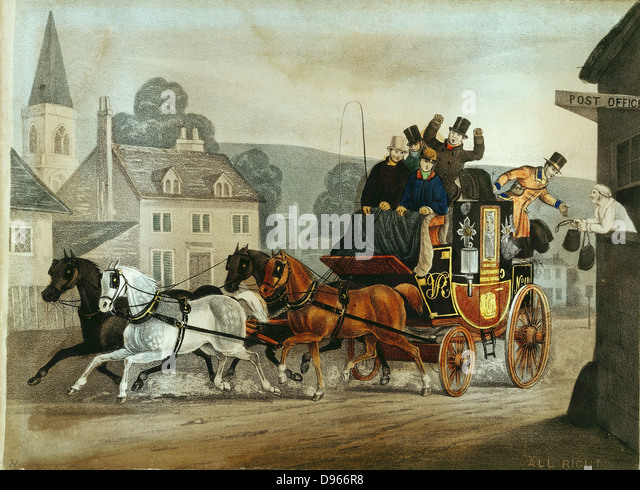 "On the night of 20th October 1816, the London to Exeter mailcoach was destined for London. Nicknamed ‘Quicksilver’ due to its speed, it was carrying mail, a mail coach guard, paying passengers, and a coach driver. The lioness had escaped from a travelling menagerie, stationed in nearby Salisbury Plain. She trotted alongside the mail coach, which whilst alarming the horses, did not perturb the driver, who mistook her for a calf. When the mail coach pulled into its scheduled stop at Winterslow Hut, the lioness pounced and attacked one of the horses." The story has a happy ending because the horse survived, its owner was compensated, no person was physically injured (although one passenger was apparently so shocked they were admitted to a mental asylum !) and the lion continued its circus role as demonstrated below. In an historical context the poster illustrates a far more profound development in man's philosophical relationship to the wider world and its ecology, the ramifications of which have become ever more serious and detrimental. In the film, Fort, late of Eton, Balliol and journalism, chooses to concentrate on just a few aspects thrown up by his journey along the A303. How it illustrates the social phenomenon of twentieth century car ownership and its impact on the physical environment, tearing through the ancient landscape like a faecal stain. Yet to do so he could marvel at the detailed and exquisite drawings down to the last drain-cover positioned or existing oak tree reprieved. It is essentially a modern story of humans on the move in a way never before known. Now incredibly as a nation there are around a quarter of a million miles of paved roads in the country and over 400 billion miles covered by people in wheeled, largely motorised, vehicles each year, representing nearly 90% of the total travel. Between 1970 and 2015 the figure has virtually doubled, the consequences of which in terms of health and environment are all too familiar. "About the year of our Lord DCCCCLXIII upon this spot beyond the time of memory called Deadman’s Plack, tradition reports that Edgar, surnamed the peaceable, King of England, in the ardour of youth love and indignation, slew with his own hand his treacherous and ungrateful favourite, owner of this forest of Harewood, in resentment of the Earl’s having basely betrayed and perfidiously married his intended bride and beauteous Elfrida, daughter of Ordgar, Earl of Devonshire, afterwards wife of King Edgar, and by him mother of King Ethelred II. Queen Elfrida, after Edgar’s death, murdered his eldest son, King Edward the Martyr, and founded the Nunnery of Wor-well." The story is a gory one of treachery and retribution and Fort takes advantage of it. He tells us the the monument was a relatively recent (19th C.) one raised by a local land-owner, maybe as an example of Gothic Revivalism for which the Victorians were renowned, but he does not advise the caution due to the story. As so often happens today, a false story is often more attractive and obdurate than the true one. From Wikipedia we glean the following: "The story of Æthelwald's murder was first described by William of Malmesbury, a 12th-century historian, in his Gesta regum Anglorum ("Deeds of the kings of the English"; 1125). William's account was later repeated by David Hume (1711 – 1776) However Macaulay (1800 – 1859), threw doubt on it saying it resembled some of the legends of early Rome. He points out that even William of Malmesbury "does not warrant their truth, and that they rest on no better authority than that of ballads." Other 12th Century chroniclers describes Æthelwald's death at the hands of unidentified armed men in Wherwell Forest (Harewood Forest)." So the monument amongst the trees may be no more than a romantic folly, a memorial to unconfirmed violent events in Anglo-Saxon England a century before the Normans arrived, changing everything. Fascinating none the less. Many regard the Harrow Way one of the very oldest continuous routes for men and animals in the country. Its origins are too far back to even date. As Fort remarks it may have first been marked out by reindeer and other post Ice Age wild beasts! It runs on a not too dissimilar line to the A303 itself but significantly further connecting the Straits of Dover, Canterbury and Thames Estuary with the South West not far from Exeter. Pre-Roman invasion, this was all Celtic-culture country, although a patchwork of local tribal areas and jurisdictions about which virtually nothing is known. Pre-Iron-Age earthworks and burial mounds mark the route. Some think the name is derived from 'here' meaning military; or 'har', meaning ancient (as in hoary); or 'heargway', meaning the road to the shrine, namely of course Stonehenge. As we shall see there is certainly archaeological proof that two thousand years before Christ, individuals travelled from at least central Europe, presumably during the great feasts held there, of which there is also archaeological evidence. This is a time when the properties of metals and their utility for both essential activities as felling trees or processing animals for food and skins, was beginning to be recognised and greatly valued. Tin and copper, required to make bronze when heated at high temperature, could be found in streams and surface outcrops in Devon and Cornwall - even that precious metal gold. Malleable lead so useful to the Romans for their water works, was relatively plentiful in the Mendips. Such materials once identified were commodities that required labour, processes, transport, barter and trade and the routes over which they were carried. In addition, no doubt as Christian pilgrimage became established, existing routes were employed as classically much later Chaucer's iconic work enshrined. Canterbury in the east was founded in 597 AD by Augustine, Winchester in 660 AD. We should not forget however, before Augustine arrived a Celtic Church was already established carried by Irish missionaries to the Cornish Coast as still existing Church Saint names testify. In other words, the Harrow Way, rather like the A303, is embedded in British history, adapting itself to the needs and necessities of the time from the last Ice Age around ten thousand years ago, onwards. Fort's next stop via the Co-op's biggest food distribution centre in the country, affectionately named "The Great Shed" and sign of the times, he steps back to remember how trade was previously carried out since time immemorial. Weyhill Fair, which for over 800 years was one of the most important in the country, the oldest written record of it dating to 1225 was located just off the A303 in the place of that name, now just a village but then the site of a great gathering of people animals and associated traders at least three times a year. 'The Great Shed' and places like it, have now taken its place and England, once noted for all its markets and fairs, is now largely no more. Livestock once driven on the hoof, are now driven in trucks, though their destiny is no better. Town high streets gradually replaced the market in the town or village setting. Smaller cattle markets too gradually disappeared. Now humans are herded into out of town 'super' markets and shopping malls, or even do their shopping at a computer screen such as this, without even meeting another person. Weyhill, and other fairs like it, was as much a social occasion as a business one. It was one of the things that formed a consensus and melded a nation. Weyhill Fair was one of England’s most important Medieval fairs and one of its oldest, a written record of the fair in 1225 testifies to it being a well established fair known as La We We or De La Woe. At its zenith, 100,000 sheep were traded there! Passing from Hampshire into Wiltshire, the county names themselves redolent of the distant past, he is beset by Iron Age tumulae - a large earth work or burial mound - everyone recording an individual obviously considered very important in his day. Just think of the effort required? It rather puts the puny mounds of today to shame doesn't it? And given the number dotted about this chalk landscape, it begs the question where the tribal leaders came from. Did each burial require transport over long distances and what was so special about the area to require it? We can only imagine the festivities that accompanied the interment or the pre-Christian belief system that underpinned them. Fort moves on to Beacon Hill, one of two in Wiltshire and one of many throughout the country, probably from their utility as warning fire beacons in case of invasion danger. Much earlier it was likely a fortified encampment. Fort views the surrounding panorama - the sinuous A303 to the south and multiple burial mounds that dot the Salisbury Plain landscape. What he describes as a "prehistoric graveyard". In the ages before the invasion by the all-conquering Roman Empire, it represents a largely lost Celtic civilization that once spread across most of the European land mass, with roots going back to the last ice age and presumably beyond. These natural hills were occupied right across the south of England as defensive positions. Insecurity, dynastic competition and heroic battles are written into them, though obscured by time. It is typical of many that utilize a high point, then modified with additional defensive earthworks, the remnants of which can still be seen. Iron age and earlier hill-top forts were likely to have been utilised subsequently against the Roman invaders and by the Romano- British against the invading hordes of Angles, Saxons, Vikings and Danes in turn. Beacon Hill is only one of hundreds of topographical locations that were used strategically for defensive purposes and places of refuge. They are like like silent friends: tantalising and infuriating in equal measure. 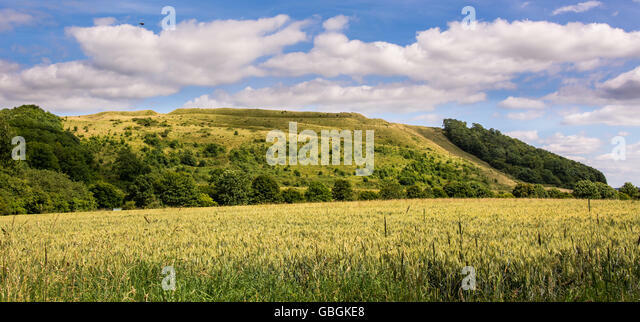 The following image of Battlesbury Hill not that far away, gives a good impression of the organised effort that must have gone into constructing them around the time of the Egyptian pyramids and of the constant dangers that necessitated them. Battlesbury Hill in Wiltshire. Site of Iron Age fort on the edge of Salisbury Plain. Like the A303, the hill forts are examples of impressive civil engineering projects requiring considerable skill and advanced organisation. One day the remains of the A303 may be equally enigmatic and puzzling to future generations. 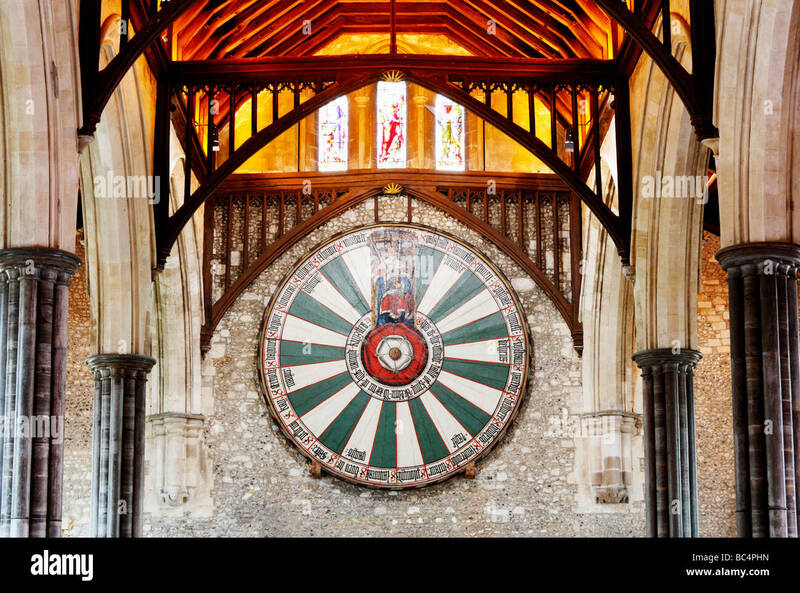 King Arthur's round table in The Great Hall, Winchester castle, Winchester, Hampshire, England. 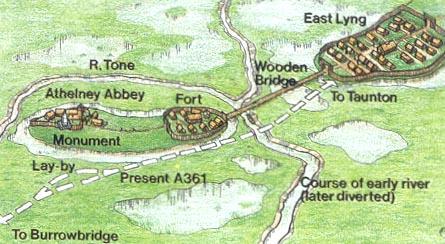 Further down the road there is another Iron Age location - Cadbury Camp - that Fort strangely skips. Recent excavations have revealed artifacts from human occupation and use from the Neolithic through the Bronze and Iron Ages. The site was reused by the Roman forces and again from c. 470 until some time after 580. In the 11th century, it even temporarily housed a Saxon mint. If legend can be believed, this has an even more romantic and significant place in early English history as King Alfred's Camelot. In the absence of documentary evidence, we have to thank the early Norman Kings and later Romantics for the legend of Arthur and his 'round table' court. 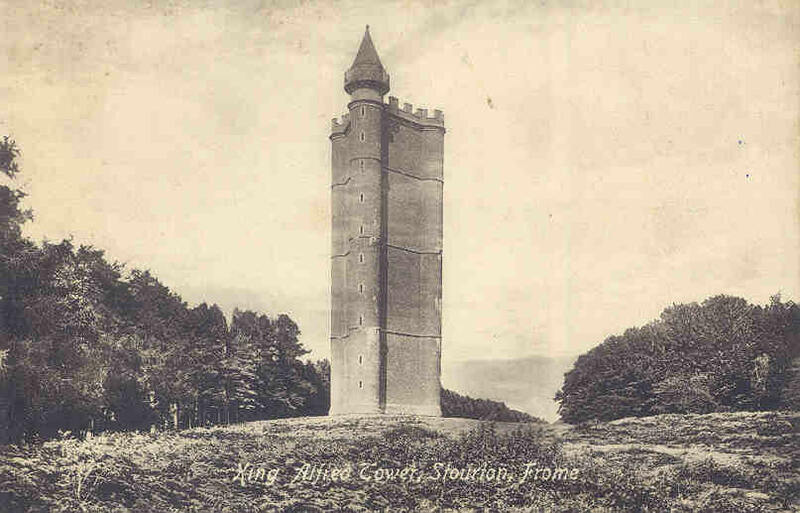 The character of King Alfred is shrouded in mystery, but is defiantly enduring. There appears to be no reference to such a figure in the earliest English and Celtic texts and he may therefore be emblematic of a number of Chieftains or of a whole heroic defence of a doomed culture, finally defeated by Athelstan, the first King of all the English in 937. The period between this great milestone (937) and the date the Roman legions finally departed, was one of continuous battles between the Romanised tribes that remained and the invading hordes from mainland Northern Europe. 'King Arthur', or someone like him, may well have led the forces that in 577 fought and stopped the progress of the Anglo Saxons at the Battle of Deorham, thought to be somewhere north of Bristol and Bath. 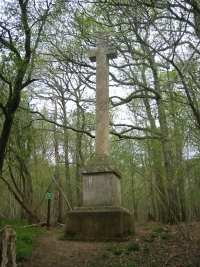 A huge earthwork called the 'Wansdyke' that runs from the Bristol Channel to Marlborough and the Savernake Forest, probably marks the agreed demarcation line that over the the next four centuries was continuously eroded until the Celtic civilization was forced to retreat to the extremities of Cornwall and Wales with a brutal repression. Wikipedia reports, "William of Malmesbury (where Athelstan was interred) writing around 1120, says that Athelstan evicted the Cornish from first Exeter and then the rest of Devon: "Exeter was cleansed of its defilement by wiping out that filthy race" he wrote. The Cornish Romano-British aristocracy were expelled. Under Athelstan's statutes and it eventually became unlawful for any Cornishman to own land, and lawful for any Englishman to kill any Cornishman (or woman or child)!" Cornish resistance came to a final conclusion in 931 AD when Cornish Celts supported by Danes were massacred in the far west of the County at Boleigh, just outside present day St Buryan, before moving on to the Isles of Scilly to 'mop up' resistance. A field named Gul Reeve - a corruption of the Cornish Gwel Ruth, meaning red field - apparently still exists. Fort's next stop on his journey was to inspect a skeleton discovered in 2002 at the site of a new housing development not far from Stonehenge and named after the location - Amesbury, although his origins and story are far more exotic - and the fact that he was found with numerous arrow heads. He dates using radio-carbon techniques, from the Bronze Age around 2300 years before Christ. He now lies in an open white sarcophagus, nakedly exposed to those that go to see him in the Salisbury Museum, effectively drained of all personality and identity other than a collection of white bones. He has become a tourist attraction and we must use our imagination to recreate him in our own image, whilst remembering we share his fate. In archaeological terms he is however very significant. No pre-historic grave site in Britain has given up more in the way of grave artifacts. Besides the many flint arrow heads, he also possessed three very small copper knives, flint and metal working tools, stone 'anvils' and boar's tusks. Stone wrist guards and shale belt ring were found, as well as a pair of gold hair ornaments, that must indicate a degree of wealth and status. Five 'Beaker Culture' funeral urns were also buried with him. A much younger man sharing a distinctive genetic feature was discovered not far removed. Were they father and son? Scientific analysis of his tooth enamel suggested he came from a central European Alpine region. A hole in his jaw and a missing patella (kneecap) and associated bone damage, showed he must have suffered great pain and probably injury in his life time. Beyond the assumption that he was a skilled metal worker and huntsman who had travelled many hundreds of miles to be at Stonehenge, we can only surmise how he fitted into the local scene. Was he regarded as benefactor or threat; was he welcomed and lauded or ostracised and ill treated? Whatever the circumstances of his life and death, it seems clear that he was buried with some care and respect or the valuable possessions would surely have been robbed. It also appears likely that others ensured his companion was buried near him at the same time or shortly after. His presence at the site may well suggest that Stonehenge had a continental reputation that attracted individuals with special skills to hawk or share. Maybe he was one of the earliest 'commercial travellers'? If Fort's 'odessey' was a symphony, this stop-off would definitely be a crescendo. Stonehenge is the principal monument of its type; namely circles of stone monoliths. It is not the oldest, and those at Avebury and Stanton Drew are more ancient and primitive. Some of the circles are about 6000 years old and research has shown in many cases Monoliths or Meneers were preceded by circular structures utilising timber posts. The purpose of these is much debated but it is not difficult to imagine the huge influence cosmology must have had, exciting in the primitive mind both the practical and spiritual significance of night and day and the objects of light that followed predictable times and courses. So it is reasonable to assume that Stonehenge, which significantly is located almost exactly half way between the eastern and western extremities of the southern portion of the land mass, was a sort of culmination of the knowledge, experience and belief system that had for centuries preceded it. The herculean task to source from distant parts the stones and transport them given the primitive methods and routes then available, is indicative of a very advanced system of engineering and political organisation, about which amazingly virtually nothing is known. However it is not difficult to imagine the pride that was exhibited in the achievement or that the place was the site of regular vast gatherings to feast the main solar events. So with a brief stop at what he describes as, "the oldest cross roads in this country," where the A303 passes over the A350, he moves on to another monument to a legendary monarch - Alfred the Great - certainly on a epic scale commensurate with the man's achievement. As a salutary aside, how many Britons today could say who he was? Obviously the man who built the monument in 1770 thought differently, or was this really intended as a monument to himself, the fabulously wealthy banker, and builder of Stourhead house and gardens, Henry Hoare? We have previously touched on King Arthur the legendary Romano British king, but now we have to move on several centuries to Alfred, King of Wessex from 871 to 899. Monarch for a mere 28 years yet only one of two English Kings to be afforded the epithet "Great". (The other was Cnut or King Canute famous for telling the waters to recede) Why so? Alfred was the Anglo-Saxon son Aethelwulf (the name rather gives it away) and was the first to style himself "King of the Anglo Saxons". He is principally remembered for defeating the Viking invaders and creating what came to be known as Danelaw in the North. But his 'greatness' appears to have resulted as much from his character and achievements as it does from his military successes. He favoured education in the native tongue, by then English not Celtic, rather than the Latin of the Catholic Church, (despite the fact that Pope Leo IV anointed him as king in Rome) in the process extending literacy. He also introduced important improvements to the law and military. In 871 after succeeding his brother and several significant Anglo Saxon defeats at the hands of the Danes, he managed to persuade them to retreat to London on their way out of the country, probably with large bribes, subsequently termed "danegeld". Five years later the action moved to Devon where the Danes attacked Wareham and Exeter and were eventually forced to withdraw after breaking their vow not to harm the hostages. In 876 they again attacked Chippenham and Alfred was forced to flee, holing up in the Somerset marshes at Athelney. This is where by tradition he burnt his cakes! Having driven along that road so many time, one day I really must stop and explore. Somerset and Wiltshire were the locale of these great events of final submission by the Viking leader Guthram and with his Lieutenants the adoption of of Christianity and and the signing of the the Treaty of Wedmore, no doubt under considerable coercion! 15. A Second WW Plane Crash! In more recent times the tower contributed to another hardly remembered tragedy. In a book by Jon Maguire's, "Gooney Birds and Ferry Tales" the victims were listed as Pilot 1/t Winfield H Malone 325th Ferrying Sqn, F/Engineer M/Sgt Loyd F Cheek 320th Transport Sqn, Cpl Henry A Mazzie (possibly Mazzei) of 320th. (If Alfred is commemorated, should not these names be also?) Apparently the plane "was on a flight to deliver a tire and wheel for a Lockheed Hudson which was damaged earlier at Preston, Scotland. Thus the deadly consequences of epic military struggles to maintain British independence and freedom from foreign enemies are connected over a gulf of more than a millennium. Perhaps it is a lesson that current Brexit negotiators should be reminded of? Strange earth formations Stourhead, Wiltshire. Moving swiftly on, Fort stands atop Ham Hill, to point out a very straight section of the A303. It is a remnant of a two thousand year old civil engineering project carried out by the Romans when they took over the country between 43AD and 410AD. Amazingly it ran - and to a certain extent, still runs - in an almost straight line, almost 230 miles from Lincoln in the NE to Exeter in the SW.
For much of the route it has been widened and otherwise improved beyond recognition but to get a better impression Fort undertakes a slight diversion onto an unclassified country lane, but still as straight as a die. In certain places the road dips through deep cuttings worn away by thousands of years of passing feet, cattle, transport and the erosion of the elements. 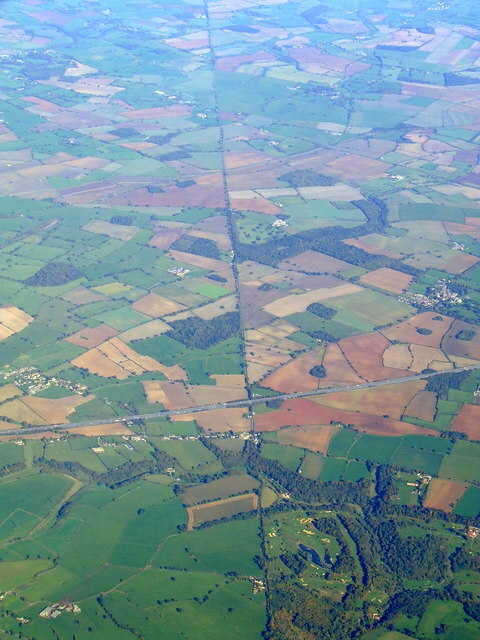 As can be seen from the above illustration, the Fosse Way was only one of the many great Roman roads constructed primarily for military purposes, but undoubted economic benefits for all the people that used them. Even so for the subjugated Celtic tribes and settlements they must have been viewed with considerable fear and loathing - a very evident manifestation of Roman power and authority. It has beenoted that in many places, pre-Roman settlements and road do not intersect. Gradually as the advantages of Roman culture began to be felt and despite pockets of resistance and rebellion such as that of Bodicca at Colchester and London in about 60AD, a more settled economic and social network must have prevailed as indicated by Romanised building techniques and styles distinctly different and improved on the British model of Round House, though presumably persisted for some time. 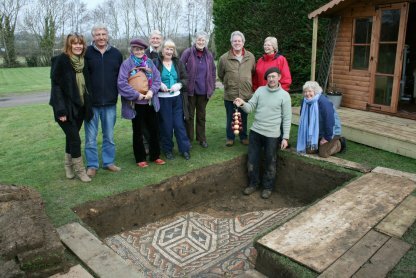 At Fort's next stop at Lopen in Somerset, he literally 'unearths' a small but exquisite example of Roman domestic architecture - a tesselated floor. 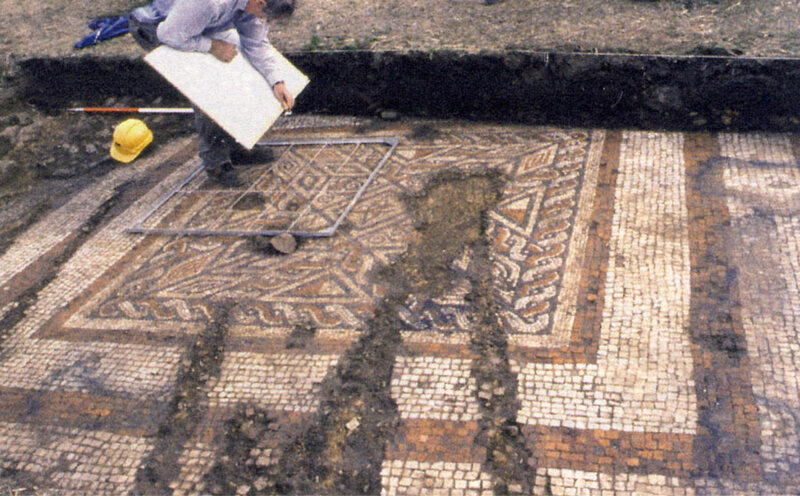 In October 2001 an important Romano-British mosaic pavement was found in Lopen. 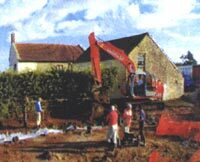 Late one evening, the owner of the farm, George Caton whilst digging, noticed unusual small cubes of stone. He cleverly and responsibly stopped work and next day in daylight, carefully uncovered a small area of the mosaic, which was later professionally excavated to reveal a large, elaborate and well preserved Roman mosaic pavement. George Caton on his digger. Here is a superb example of a Roman mosaic floor created at Fishbourne, West Sussex in about AD75 and rediscovered in 1960 during civil engineering works. For size and quality it has been termed a 'Palace'. There are undoubtedly hundreds or even thousands more laying undiscovered under the soil of Britain. "The large 14 foot (4.3m) square mosaic from the floor of the frigidarium depicts the story of Aeneas and Dido, as told in the 1st century BC by the Roman poet, Virgil. Like the villa, it dates to the mid-4th century. The Low Ham mosaic is unique in Roman Britain in providing a narrative story in five panels. First is a scene of Aeneas sailing to Carthage, with Achates lifting from a ship the crown described as a gift to Dido in Aeneid Book I. The next shows Aeneas meeting Dido, with his son Ascanius and his mother Venus. There follow scenes of the couple out hunting, of the couple embracing, and either of Venus, or else of Dido left alone after Aeneas' departure. It is the earliest piece of narrative art in the country. It was lifted in 1953 and is now on display in the Museum of Somerset." Roman discoveries in Somerset continue, as with this inscribed lead ingot in 2016 near Wells. The Mendip Hills to the north of this ancient settlement, now famous for its fantastic medieval cathedral, were of course of strategic importance to the Roman empire and must have had considerable economic importance for the whole locality. This may go some way to explaining the multiplicity and importance of the Roman finds in the county. 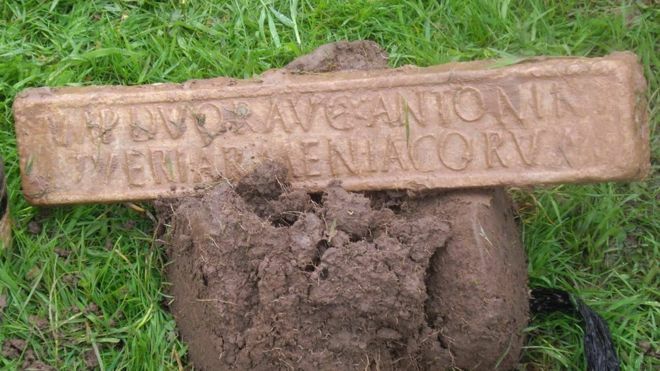 The ingot of Roman lead unearthed on a farm in Somerset. Jason Baker discovered the very rare, 2ft (60cm) ingot, weighing six stone (38kg) at a Wells farm in 2016. It dates from 164 AD and is inscribed with the name of emperor Marcus Aurelius Armeniacus. So with a little discursive detour about 18th Century road improvement as a result the Turnpike Trust innovation, effectively toll roads that then covered the country, and some of the first attempts to harness steam as a mechanical alternative to horse and carriage, he nears the end of his odyssey down his "Highway to the Sun". I have to say with a heavy heart, that on the many thousands of times I travelled these routes, I have lost count how many times I have witnessed dead badgers. This was particularly so during nearby road works or the other periodic extermination campaigns that continue in areas of high bovine TB incidence, for which this poor animal has, unfairly, been blamed. Slipping into "Watership Down" mode, it was hard not to humanise their plight, or to the disruption to their quite, pacific lives by human intervention, and the need to travel unnecessarily from one place to another. The disruptive effect of all those engineering and technical innovations and 'advances'. Sometimes it is desirable to get off the road and view it from a distance - as Fort did on several occasions - to put it into perspective. Is our advanced technological world actually taking us where we want to travel? We have looked back over two thousand years and more. What if we look forward that same time span? 19. "From now on it turns into more of a country road"
How familiar this section of road appears to me! That sharp corner and to the left a deep wooded valley and a quaint Mill House where I once visited to check out the renovations that were in progress. From Honiton it was one of the remotest locations in my mini-empire on the border between Devon and Somerset. In the nearly fifty years that have elapsed since, every time I passed, I wondered what events had taken place there and what has happened to the time. It always struck me as an example of romantic topography. 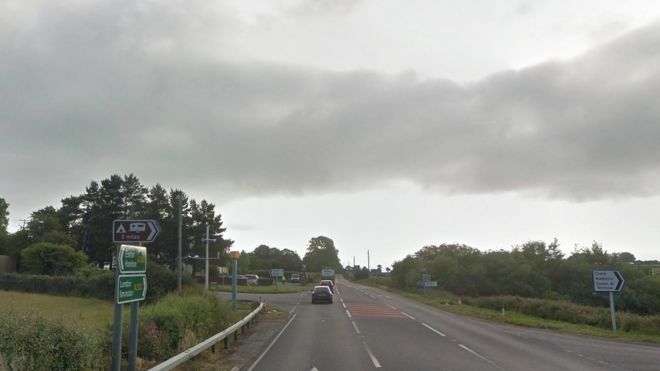 Fort soon after inevitably comes to the end of his road at a junction with the A30, which picks up where the A303 leaves off, largely untrumpeted and unnoticed. At a lay by he is lucky to encounter a friendly and sympathetic face and a delicious breakfast. It is the most any of us can hope for when we reach the end of the road. If you have stayed with me on this particular journey, I hope you have enjoyed it. And now having read the book, I suggest you watch the film!